Not sure how the whole process of garbage bin rentals work? You’re in luck. 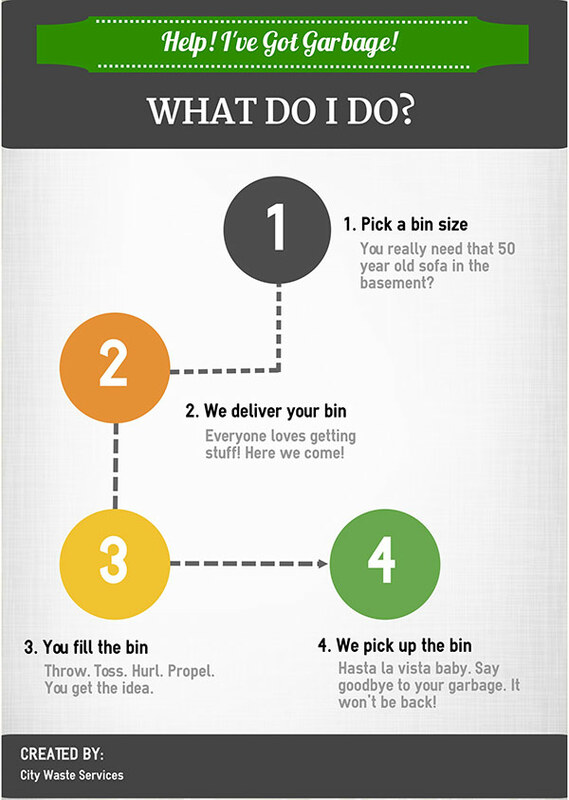 We’ve created an infographic to help explain the steps you would take to rent a bin to make it easier to understand. For those of you who like a little more than pretty pictures, read on to find out more. Pretty obvious, right? The size of garbage bin you rent will depend on what you are putting in it. 14 yard or 20 yard bins are usually good enough for most home renovation or small construction type garbage. If you’re not sure about how much junk you have, the 30 yard is a good alternative to the 20 because the bin rental price is the same for mixed waste. You’re then charged by weight for the waste you put in the garbage bin. See our bin rental prices for more details. If it’s clean fill (soil, concrete, etc) you are disposing of, a 8 yard bin or 10 yard bin will usually be good enough. Our calculator can help gauge the space you’ll need for an area of clean fill. We’re here to help, so give us a shout if you need help picking a bin rental size. Here comes your bin! To make sure we don’t damage your driveway, we lay wooden planks down before carefully placing the garbage bin onto them. Arguably the most enjoyable part of the process! Who doesn’t like to finally get rid of all their junk? All you have to do to load your dumpster is open the rear doors and start filling. The days of pretending to be an Olympic hammer thrower with garbage are over, unless that’s what you like to do in your spare time. Our garbage bin rentals include 7 days usage so you have enough time to fill your bin. Need more time? No problem, we’re flexible, remember? Just let us know and we’ll take care of you. Are you ready to say goodbye? Did you throw a farewell party for your junk? Because this is it! We pick up the dumpster and your junk is gone and on its way to be recycled, reused or disposed of.